Thought I would put this out there for those that may not know. NCSU offers "all inclusive" Holter Monitor Rental for $150.00. This includes all needed equipment, shipping (both ways) via FedEx and reading by a Board Certified Veterinary Cardiologist. Thank you so much for this information! I did not know this. My girl is 3 and I want to get this done. Thanks for posting this. I am going to "stick it" for the future. Dogs Name: Caleb's All Things Bright & Beautiful : "Reina" and Caleb's Blaze of Glory: "Rocco"
This is unbelievable. Thank you for sharing. Last edited by Feverhaus; 10-21-2015 at 07:16 AM. Thanks for sharing this! This is right up the street from my house! Wow, this is great! I just missed a cardio clinic that was about 10 mins from me but will keep checking for updates. Thanks for posting. When we had Stryker down to NCSU for his DCM Stem Cell appointment they were great!!!!!! what is a dcm stem treatment? Does anyone have any other places that rent Holters? I was with NCSU for 4 years until last year when they over billed me and they refused to correct it. At what age should I get the first holter? My dogs' cardiologist(s) have aways recommended starting to do echos and holters at around 2 years. The Mt Hood DPC has for many years now had two cardio clinics each year (one in the winter and one in the summer) and I start young dogs between 2 & 3 years. For roughly the next 4 years I do an echo and holter yearly and from 7 years or if there is substantial deterioration from one yearly test to the next I start doing the testing every six months. Hi bug,,, Yeah, I want to get McCoy cardio-testested within the next year. Normally, I would just bite the bullet and pay for it. What exactly does the Mt.Hood club offer. Do you have to be a member? No, you don't need to be a member but unless you have or know someone with a Holter set up, becoming a member is the least expensive way of doing an echo/holter and MHDPC does require a holter performed within 2 or 3 months before the date of the clinic when they will have the echo's done. Gets you a lot of value for that $25 or $30 membership fee. I think that echo's are running $450 and up with any of the 4 cardiologists in and around Portland these days. Dr Wood and Dr Atkinson are both down toward Lake Oswego, just off I-5. North West Vet Specialties is off I-205 at the very north end of Clackamas County and there is another who is connected with a different Specialty group and I can never remember the names of either the last two. And there is a cardiologist connected to the small animal clinic at the vet school (Eugene)--I think Michelle sees that one. question new mom here . You should NOT be getting a puppy from a breeder who hasn't given you any of this information!!! 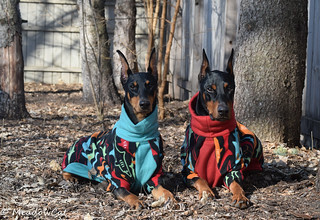 Yes, statistically over half of Dobermans will die from DCM. We are seeing dogs younger than 3 diagnosed and dying of DCM. This is a HUGE issue in the breed.